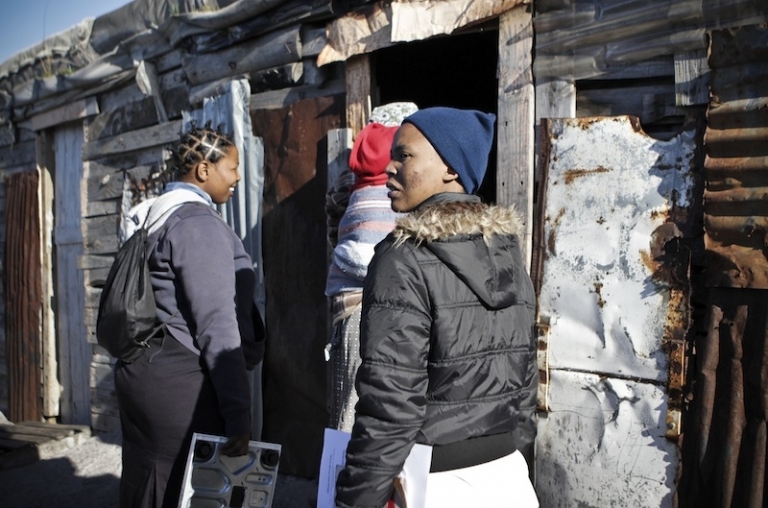 Iraq is one of five informal settlements in Grabouw, a small town lying just outside of Cape Town. The settlement got its name from being considered the worst place to live in the area; it is the poorest and furthest up the mountain. Other settlements in the area have names such as Melrose Place and Beverly Hills. While the community of Iraq is small, it has one of the highest HIV prevalence rates in South Africa (34%). 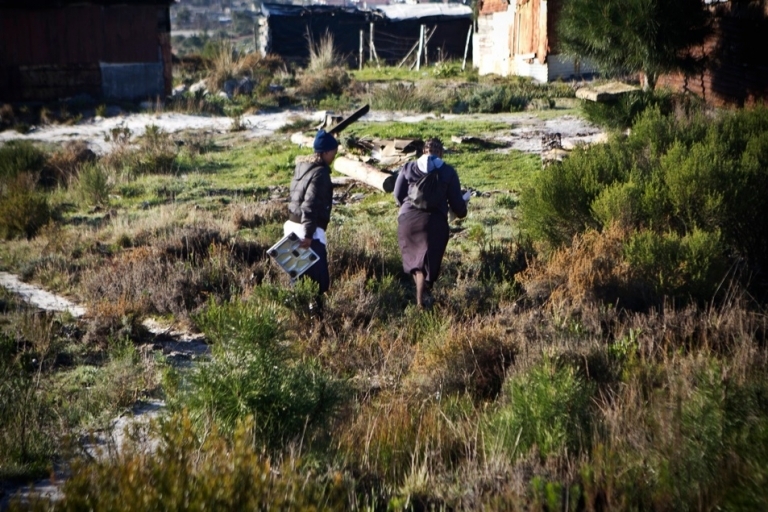 Alarmingly, the area of Grabouw does not have a clinic with overnight facilities or on site doctors. The difficulty of reaching healthcare services meant that the residents of Iraq were unable to regularly access their treatments and were subsequently defaulting. 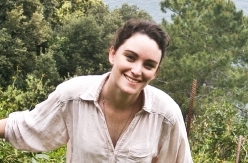 This is especially concerning where adhering to treatment for HIV and TB is crucial. This is where Xnesh and Sindy come in. 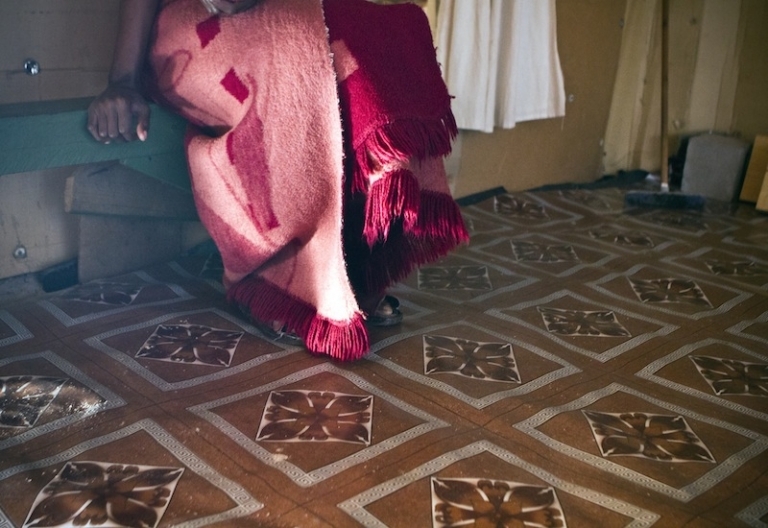 Together, they visit the homes of people who live with HIV and TB. They deliver medication, make sure patients adhere to it, administer basic care, perform checks and schedule referral appointments with the doctor when needed. This personal care is free for the people of Iraq, through the support of Themba Care Organization who have facilities in Grabouw. Xnesh and Sindy serve as the link between patient and clinic. 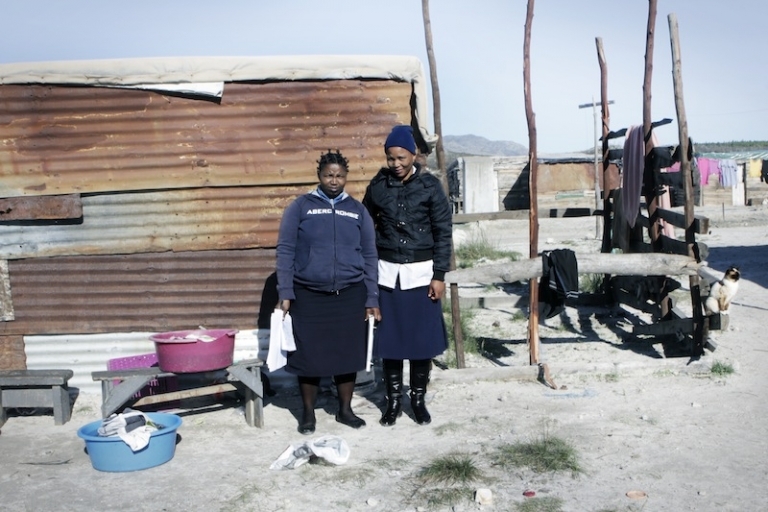 It is evident that such care does not come without emotional investment, overwhelming compassion and personal responsibility for a community that Xnesh and Sindy want to see get healthy. 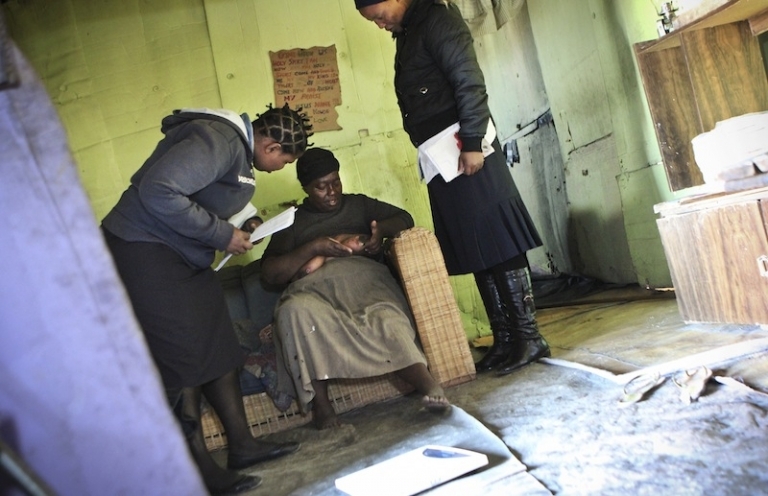 The Community Health Worker model is one that is being adopted in many communities as a way of combatting the country’s crippling HIV & TB crisis. It is part of a shift within the public healthcare system, which seeks to decentralize public healthcare from the hospital, to the clinic, and into the community. Xnesh and Sindy arrive at their first patient’s house. They start their day at the top of the settlement, high up on the mountain and make their way down on foot visiting each of their patients. 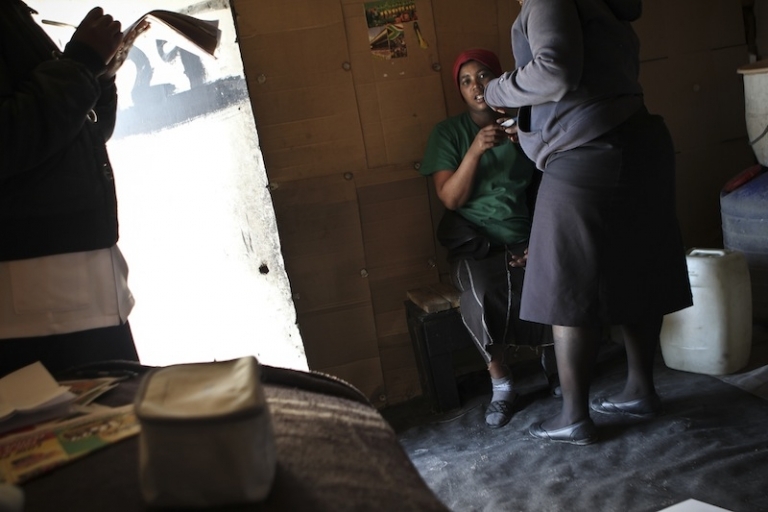 Xnesh and Sindy in the house of Thandiwe, who is HIV positive and receiving her ARV’s through the ladies. Xnesh and Sindy have been visiting Thandiwe for 2 years. Thandiwe also has TB for which she is receiving medication. Neither of the ladies wears masks while working. 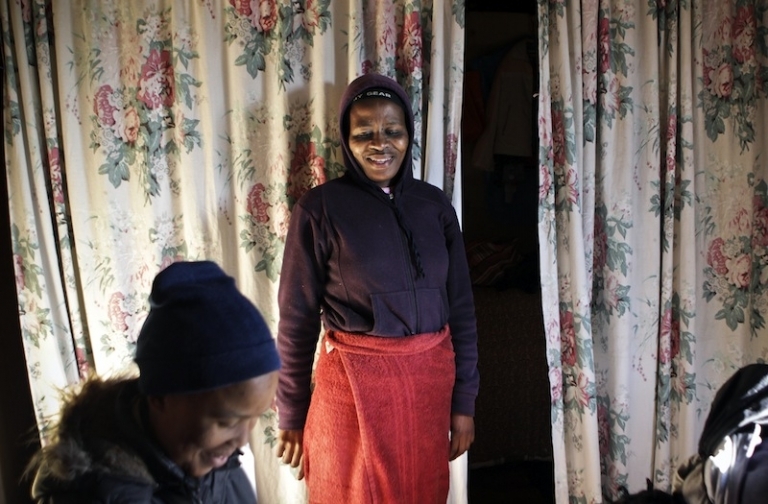 Kholeka has HIV stage 3, which means that the virus has significantly weakened her. 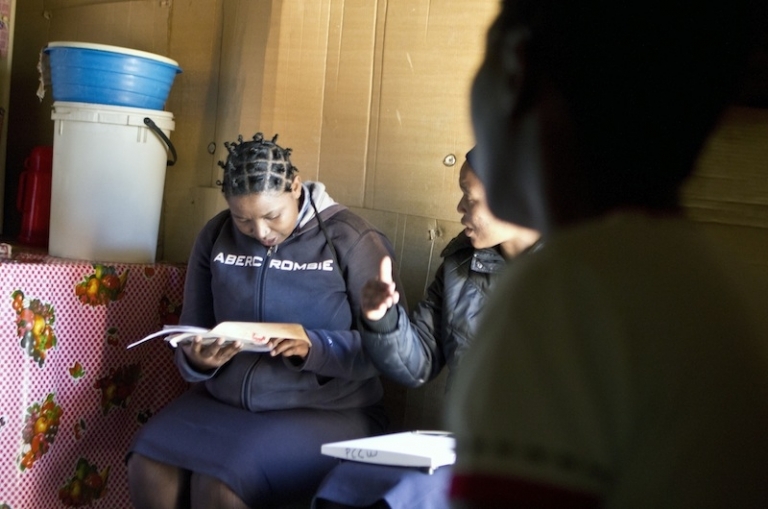 In Kholeka’s case the goal is to prevent her from regressing to stage 4(AIDS). Routine blood pressure, temperature and weight are recorded onto patient reports, which are submitted to the clinic. Xnesh and Sindy armed with a scale and a backpack filled with medication. Xnesh and Sindy arrive at Moreen Gqonono’s house. 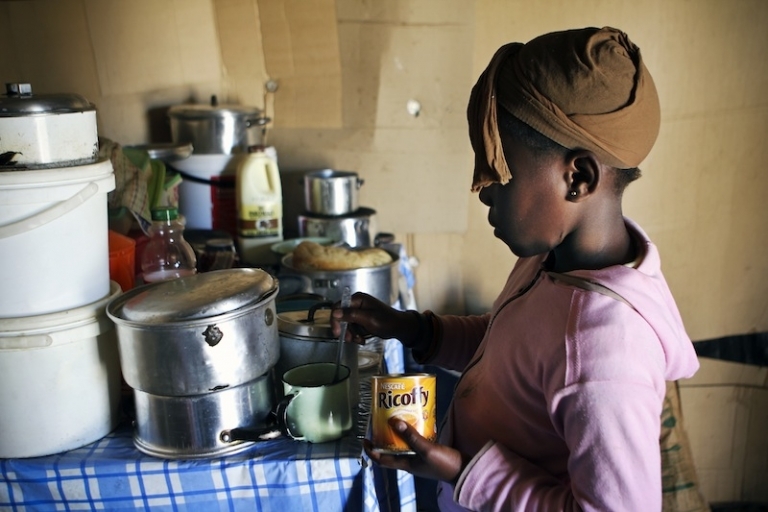 Upon their arrival, Moreen's daughter prepares coffee. Taking Moreen’s temperature. 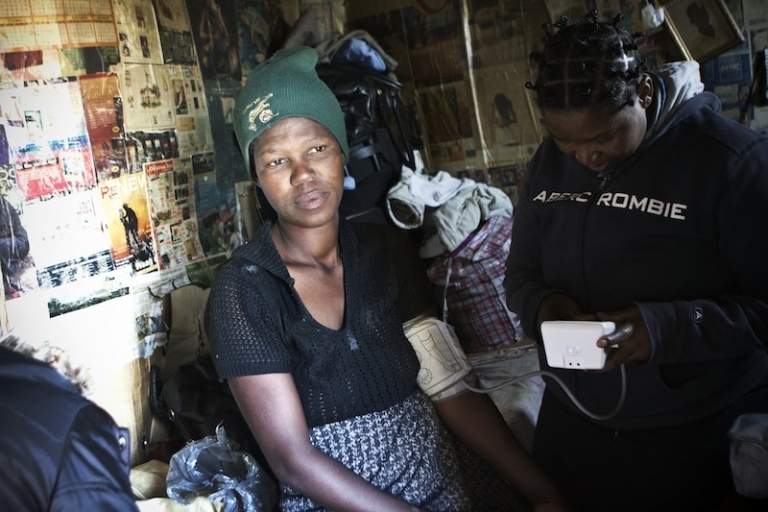 Moreen is HIV positive and has recently been diagnosed with multi-drug-resistant TB (MDR TB). Xnesh and Sindy exchange notes and talk about Moreen’s MDR-TB drug adherence. 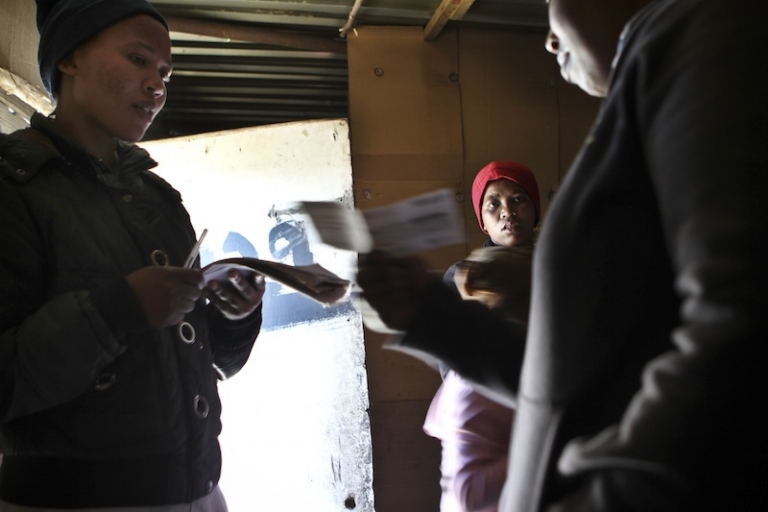 Adherence to treatment is crucial in combatting TB; especially for those who are HIV positive. Sindy helps Nthabiseng Seboka onto the scale. 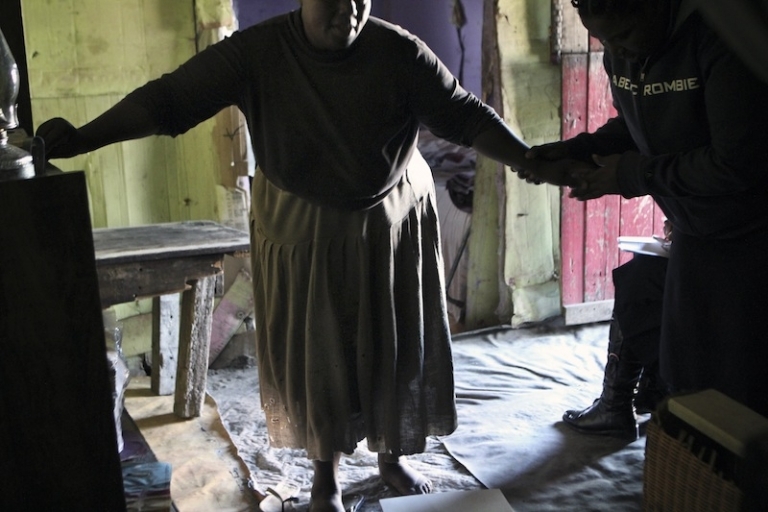 They have been visiting Nthabiseng, who is HIV positive, for 5 years. 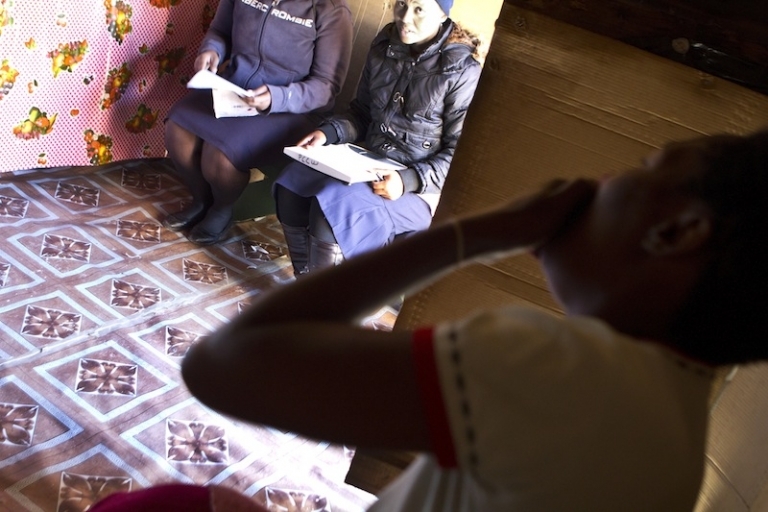 Nthabiseng shows Sindy and Xnesh the case of shingles she has developed in the past week. 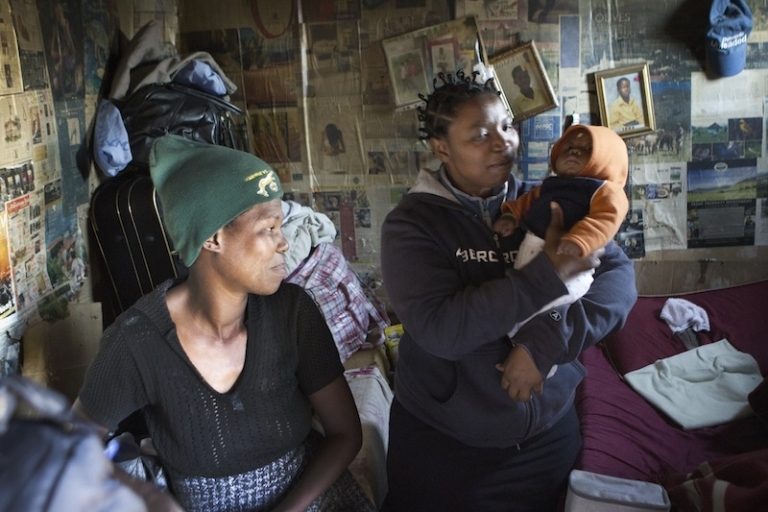 For Nomzamo Cekiso, receiving medication on a regular basis is ‘a dream come true’ in her fight against HIV. This is the healthiest Nomzamo has been in the 3 years Xnesh and Sindy have known her. Both women are smiling at the report Xnesh is writing. 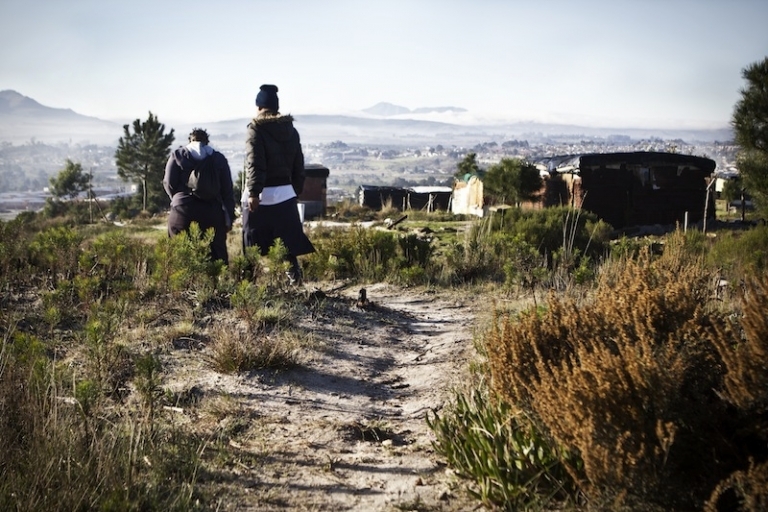 In the afternoon, Xnesh and Sindy walk back to the town of Grabouw where they meet up with other Community Health Workers based in the other settlements. Together they write reports, compare results and prepare for the next day. Send us your photo stories! Do you have an interesting story to share? Or perhaps a photo which captures something interesting about your life in Africa? Please tell your story! The stage is now yours! Congrats on the feature. This is wonderful. One of the goals of African Lens is to serve as a platform of advocacy - for stories that need to be told. This is one of them. Hopefully, this story will generate enough interest to spur more action / help towards the street kids here. What a beautiful report story !! Congratulation for your job. This is an awesome Photo story! Thanks for sharing it, currently only watched the photos, but definitely wanna read it!